You may have noticed some of your favorite websites sporting a different look Wednesday. 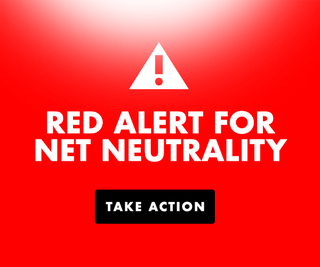 In collaboration with Demand Progress, many sites went on “Red Alert” to draw attention to the continuing fight to protect net neutrality, otherwise known as the open internet. The Red Alert for Net Neutrality is part of a continuing effort to get everyone involved in the activism and support for net neutrality. The Senate is about to cast a vote to save net neutrality. Reuben Hayslett, a campaigner for Demand Progress, tells The Root that the senators need just one more vote to make the Congressional Review Act pass the Senate. It would then move on to the House for a vote. If it passes both legislative bodies, the bill would stop the Federal Communications Commission’s repeal of the net neutrality rules put in place in 2015 by the Obama administration. Various websites and mobile apps joined in Wednesday’s Red Alert activity by adding homepage splashes and in-app messages to drive calls and emails to Congress. The homepage splashes and in-app messaging will then be used to keep up the energy through the vote the following week. According to Demand Progress, the Senate CRA vote will be the biggest moment in the net neutrality fight since the FCC repeal. Because of the expedited procedures within the CRA, a vote is guaranteed with a simple majority. There are 50 senators who have agreed to vote in favor of the CRA, so only one more vote is needed to hit the magic number of 51. Winning big in the Senate will be essential for building momentum for the fight in the House or any future congressional fight. It is imperative that we all do our part to protect the internet. Should the FCC move forward with its plan to repeal, sites like The Root could be negatively impacted. Contact your representatives and let them know you need them to support the fight to protect net neutrality.